I just collected my lastborn’s birth certificate and obtaining it was surprisingly easier that I had anticipated. 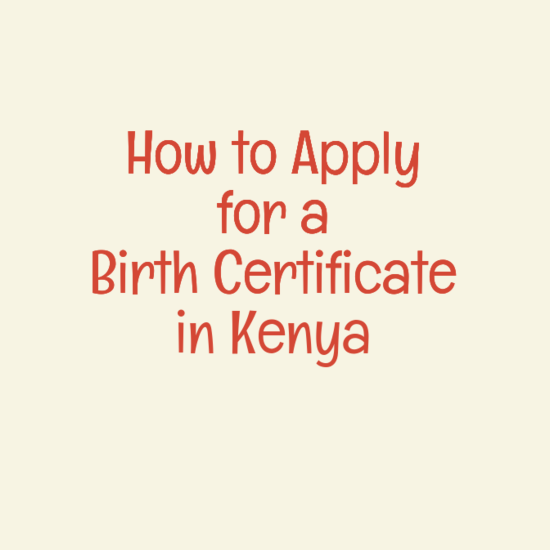 In this post you will learn how to apply for a birth certificate in Kenya. The original and a copy of the birth notification – This is the pink slip that you get from the hospital where the child was delivered. Visit your district registrar of births and deaths’ Office and you’ll be given a form to fill. You can use the names in the birth notification or you can choose a different name for your child. Changing the name will cost you a few extra shillings. Attach this form with the copies of the IDs and the birth notifications. You only pay 50 shillings to apply for a certificate without amendment. You pay 90 if the name of the parent needs to be corrected, 130 if you need to correct both the names of the parent and the name of the child. Re-registration will cost you 90 shillings, and if you are registering late (later than 9 months after birth) you only pay 150 shillings. You’ll be given a receipt which you’ll use to collect the birth certificate. How long does it take to get a birth Certificate in Kenya? I was instructed to collect mine after 2 weeks, which I did. If you do not have a birth notification (In cases where the child is born at home or late registration) you need to start the process at the local sub-chief’s office. He will provide you with the necessary documentation. If you are in Nairobi, the national government immigration and registration of person’s offices are located in Upper Hill Bishop Road. Get number 7C buses at KenCom and alight at community. The offices are just opposite NSSF building. You can also apply for a good conduct certificate as easily as you apply for a birth certificate. Thank you. One question though, some forums say even one parent's copy of ID is required. Kindly confirm. Thanks for this important information. Many people are conning parents claiming that they can help them get birth certificate. Today I was there for my daughter's birthday certificate but was not easy with everyone. I was at upper hill Nairobi office. Everyone cried fowl to an extend early afternoon people were told to go and come back on Monday. U thought it's an easy process there but not from the point of look. If someone here has influenced in that office, please do something because All I saw there was an local mwananchi suffering unexpected delay. Please without struggle and cursing let's enjoy the services we pay tax for….. I lost the waiting receipt what should I do? This article is all lies. One must give bribe in the public hospitals/ dispensary especially Pumwani and Baba Dogo to get notification.